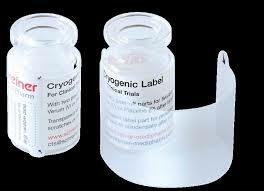 The two-layered cryogenic labels are specifically adapted to the demands of extreme sub-zero temperatures and can be complemented by other features such as detachable labels. Cold chain interruptions of biopharmaceuticals or laboratory samples to gain genetic evidence may have serious consequences. Even at low temperatures, the markings have to remain intact throughout the entire process. Conventional labels, however, may lose their flexibility, shape and adhesion at extreme sub-zero temperatures so that important information will no longer be legible. Schreiner MediPharm offers special cryogenic labels that reliably withstand such extremely low temperatures. The cryogenic labels reliably adhere to containers because the adhesive used will suffer no loss in adhesion even at very low sub-zero temperatures. Special, two-layered designs offer additional benefits: The bottom layer forms the base label to which a transparent layer is applied that has two functional features: First, it provides a barrier against condensation on the base label after removing the container from the freezer. Second, it protects the base label against abrasion and scratching. This ensures perfect legibility of the imprinted information. A second label with variable data can be applied to the base label. Detachable labels for additional documentation may be integrated, for instance to mark active drugs and placebos in clinical trials.